Munich-Riem Airport, the old city airport, served Munich from 1939 to 1992. First plans for an expansion of the airport date back to the year 1954. With rising numbers of passengers on the one hand and a growing number of inhabitants in its proximity on the other hand, plans were made to completely move the airport to another site. Bavarian government took the decision to build a new airport in the area called "Erdinger Moos" on 5 August 1969. When construction started on 3 November 1980, the small village of Franzheim disappeared and the ~400 inhabitants were resettled. 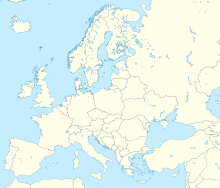 The airport is located on the territory of four different municipalities: Oberding (location of the terminals; district of Erding), Hallbergmoos, Freising, and Marzling in the district of Freising. The new Munich Airport commenced operation on 17 May 1992, and during one night the whole airport moved to the new site. The former Munich-Riem Airport closed on 16 May 1992 shortly before midnight. Munich Airport is named after Franz Josef Strauss, who played a prominent, albeit sometimes controversial, role in politics of the Federal Republic of Germany from the 1950s until his death in 1988. Amongst other positions, Strauss was a long-time Minister-President (Governor) of the state of Bavaria. He initiated the new airport project in the Bavarian government. Strauss, a private pilot himself, was particularly interested in attracting aviation industry to settle in Bavaria. He is regarded one of the fathers of the European Airbus project and served as initial chairman in the Airbus supervisory board. The company "Flughafen München GmbH" that owns and operates Munich Airport is a company with limited liability consisting of the three shareholders: the State of Bavaria (51%), the Federal Republic of Germany (26%) and the City of Munich (23%). The logo of Munich Airport consists of the letter "M" with the brand idea of 'Living ideas - Connecting lives'. Usually Munich Airport is referred to as "Flughafen München" or simply "MUC", its IATA-code. 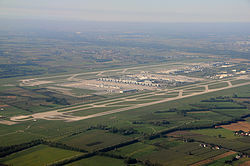 During construction the airport was referred to as "Flughafen München II". As their home base at Frankfurt Airport suffered from capacity limits back then, Lufthansa established a second hub offering several short- and long-haul connections through Munich in addition to Frankfurt. While Lufthansa serves more European destinations from Munich Airport than from Frankfurt Airport, Frankfurt has many more intercontinental routes. Between 1995 and 2006 passenger numbers doubled from under 15 million per annum to over 30 million, despite the impact of the 11 September attacks in 2001 and 2002. In 1996 the airport overtook Düsseldorf as Germany's second-busiest airport and currently handles almost twice as many passengers as the country's third-busiest airport. In June 2003 construction of Terminal 2 was completed and it was inaugurated as an exclusive facility for Lufthansa and its Star Alliance partners. In November 2013, the airport introduced its first new corporate design since its inauguration. The large letter 'M' remains in a new font type, and a dash has been added which changes between several colors. There are also animated color-changing versions of the 'M'-sign placed throughout the airport area, for example on the main entrance road and on the new Terminal 2 satellite. In June 2015, Condor announced it intends to establish a long-haul base at Munich Airport from the 2016 summer season. Condor has already based short- and mid-haul operations at the airport and resumed long-haul flights in winter 2013 after a six-year absence. In November 2015, Transavia announced their intention to establish their first German base at Munich Airport which will consist of four aircraft serving 18 new routes by spring 2016. As of June 2015, the biggest foreign carrier in Munich in terms of passenger numbers is Air Dolomiti. During 2015, Munich Airport counted more than 40 million passengers per year for the first time. In December 2016, Lufthansa's low-cost subsidiary Eurowings announced that it would establish a major base at Munich Airport from March 2017, with 32 new routes. These new base operations was carried out by Air Berlin on a new wet-lease contract with Eurowings. In February 2017, Transavia announced the closure of their entire base at Munich Airport by October 2017 after only a year of service due to a change in their business strategy and negative economic outlook. Munich Airport's dynamic growth continued in 2018 with new traffic records and an all-time high of 46.2 million passengers. The airport also saw a strong surge in take-offs and landings, with 413,000 movements, an increase of 2.2 % in 2018. With 266 destinations Munich Airport increased its global network and is among the leading air transportation hubs in Europe. Munich Airport covers 3,892 acres (1,575 ha) of land area. Most of the airport's facilities are located in the area between the two runways. The approach road and railway divide the west part into a southern half, which contains cargo and maintenance facilities, and a northern half, which contains mostly administrative buildings and service facilities, a holiday long-term parking lot and the visitors' centre. It is followed by the west apron and Terminal 1, then the Munich Airport Center (MAC), Terminal 2 and the east apron. Munich Airport has two passenger terminals, and shuffled 20–25 million people through each terminal in 2014. Terminal 1 is the older terminal and commenced operation when the airport was opened on 17 May 1992. It has a total capacity of 25 million passengers per year and is subdivided into five modules designated A, B, C, D and E. Modules A through D provide all facilities necessary to handle departures and arrivals, including individual landside driveways and parking, whereas module E is equipped to handle arrivals only. This design essentially makes each module a self-contained sub-terminal of its own. Modules A and D are used for flights within the Schengen-area, while modules B and C handle those to destinations outside it. Hall F is separate, located near Terminal 2, and handles flights with increased security requirements, i.e. those to Israel. 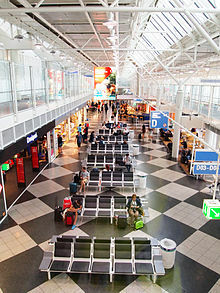 Furthermore, the check-in counters for some flights departing from Terminal 1 are located in the central area Z (German: Zentralbereich) where most of the shopping and restaurant facilities of this Terminal as well as the airport's suburban railway station are also located. The 1,081-metre (3,547-foot) pier features 21 jet bridges, two of which have been rebuilt into waiting halls for bus transfers. One gate position has been equipped with three jet bridges to handle the Airbus A380 which is regularly used by Emirates. There are further 60 aircraft stands on the apron, some of which are equipped with specially designed apron jet bridges (German: Vorfeldfluggastbrücken), to which passengers are brought by bus. This unique concept allows passengers to board with full protection from the weather but without the high investment required for full satellite terminals connected through a passenger transport system. Terminal 1 currently handles all airlines that are not members or partners of the Star Alliance with the exception of Turkish Airlines. However, owing to lack of capacity at Terminal 2, Lufthansa's subsidiary Germanwings and former affiliate Condor both moved back to Terminal 1 in 2007. Germanwings however moved back to Terminal 2 in late 2015. Some of the major users at Terminal 1 are Condor, Eurowings, Emirates, Qatar Airways, American Airlines, Delta Air Lines, easyJet and TUI fly Deutschland amongst several others. As of December 2015, a major redesign of Terminal 1 including a capacity increase and an extension of the central terminal building to the west for centralised security and shopping facilities was under preparation. In November 2016, a major €400m extension and refurbishment for Terminal 1 was announced. Terminal areas A and B will be entirely redesigned with the addition of a 320-metre-long (1,050 ft) pier stretching out on the apron. The new facilities will provide capacity for 6 million additional passengers, will be able to handle 12 aircraft including two Airbus A380s at once, and are due to open by 2022. Terminal 2 commenced operation on 29 June 2003. It has a design capacity of 25 million passengers per year and is exclusively used by Lufthansa and all other Star Alliance members serving Munich except Turkish Airlines. Star Alliance partners Air Malta, Luxair and BMI Regional also use Terminal 2. Etihad Airways relocated to this terminal as well after commencing a partnership with Lufthansa. Having been designed as a hub terminal it is not divided into modules like Terminal 1. Instead, all facilities are arranged around a central Plaza. Owing to security regulations imposed by the European Union, the terminal has been equipped with facilities to handle passengers from countries considered insecure, i.e. not implementing the same regulations. This required the construction of a new level as, unlike other airports, the terminal does not have separate areas for arriving and departing passengers. The new level 06 opened on 15 January 2009. The pier, which is 980 m (3,220 ft) long, is equipped with 24 jet bridges. As the total number of 75 aircraft stands on the east apron is not always sufficient, Terminal 2 sometimes also uses parking positions on the west apron, to which passengers are carried by airside buses. Terminal 2 is able to handle the Airbus A380 as well, however, prior to the opening of the Terminal 2 satellite building, there were no designated stands or additional jet bridges for it. Lufthansa flies the A380 into the satellite building. Terminal 2 has two main departure levels, 04 and 05 and additional bus gates on the lower level 03. Gates on level 05 (H) are designated non-Schengen gates. Until the new transfer level 06 opened, the northernmost gates were behind an additional security checkpoint for departures to the USA most of the day. The lower level 04 (G) contains Schengen gates. The bus gates on level 03 are also designated G and are also used for Schengen flights. Level 03 is smaller than the main levels and consists of two separate parts which can be reached from two points on level 04. One area of these gates is designated to Air Dolomiti. The terminal is operated by Terminal-2-Betriebsgesellschaft (German for Terminal 2 Operating Company), which is owned by Flughafen München GmbH (60%) and Lufthansa (40%). This makes Terminal 2 the first terminal in Germany which is co-operated by an airline. While Terminal 1 still has plenty of capacity left—in 2011, it handled only about 11 million passengers—an extension of Terminal 2, which operated over full capacity handling 27.5 million passengers by 2013, was required by Lufthansa and its Star Alliance partners to allow easy transfers within a single terminal and to provide more building parking positions equipped with jetbridges and additional waiting areas. When Terminal 2 and its east apron were built prior to 2003, preparations for a satellite terminal had already been made. Construction for the satellite building was approved in 2010 and started in 2012; it was completed by the end of 2015. The satellite terminal was inaugurated on 22 April 2016 and has been in operation since 26 April 2016 after trial runs made with the help of volunteers that had started in January 2016. This extension to Terminal 2 saw the already existing baggage sorting hall on the east apron upgraded and heavily extended with new floors to become the satellite terminal. Besides the baggage transport tunnel, there already were three more unused tunnels beneath the Terminal 2 apron of which one was equipped with a fully automated people mover by Bombardier Transportation connecting the Terminal 2 main building with the new satellite. In July 2016, less than three months after its opening, the satellite terminal recorded its one millionth passenger. The new satellite building is 609 metres (1,998 ft) long with 125,000 square metres (1,345,500 sq ft) of floor space. It allows an additional 11 million passengers to be handled per year, adding 52 gates using 27 parking positions, of which 11 are able to handle wide-body aircraft including the Airbus A380. The building is able to handle Schengen and Non-Schengen flights on two main levels (K for Schengen and L for Non-Schengen destinations, as well as area J for some additional bus gates) and features 44 new passport control stations and 24 security lanes for transfer passengers as well as new restaurants, shops and five new Lufhansa lounges. However, the satellite is an airside only facility, check-in and arrivals is still located in the Terminal 2 main building only. The project did cost 650 million Euros, shared between the airport's operator (60%) and Lufthansa (40%). An expansion for the satellite building into a 'T' shape is planned for the future along with another satellite and room for a possible third Terminal to the east. The Munich Airport Center (sometimes shortened to MAC) is a shopping, business, and recreation area that connects the two terminals. The older Central Area (German: Zentralbereich), which was originally built as part of Terminal 1, hosts a shopping mall and the S-Bahn station. The newer MAC Forum built with Terminal 2 is a large outdoor area with a partly transparent tent-like roof. Next to it is the airport hotel managed by Hilton Hotels & Resorts which was designed by the world-famous architect Helmut Jahn and landscape architecture firm PWP Landscape Architecture in 1994. The Munich Airport Center has a supermarket where one can shop from 5:30 a.m. to midnight every day, including Sundays, as it is exempt from the Bavarian law governing retail hours of operation (German: Ladenschlussgesetz). The airport has two parallel runways and one concrete helipad. The two concrete runways (08R/26L and 26R/08L) are each 4,000 metres (13,120 ft) long and 60 metres (200 ft) wide. A third runway would increase the number of schedulable aircraft movements per hour from 90 to 120. It would run in parallel to the existing runways and be located to the north-east of the current north runway, significantly extending the total area occupied by the airport. According to Flughafen München GmbH (FMG), the airport's operator, the current two-runway system is already operating at full capacity during peak hours, and requests for additional slots from airlines have been denied. Further increase in air traffic is expected as Munich is to become a second major hub in Germany after Frankfurt. In August 2007, the airport operator applied for planning permission from the government of Upper Bavaria. More than 60,000 objections have been filed during public display of the plans. The objections and lawsuits against the third runway were later overturned by the Bavarian Administrative Court, allowing for construction plans to proceed. On 26 July 2011, the government of Upper Bavaria issued the zoning approval for the construction of a third runway. With this decision, the zoning authority, after the intensive examination and consideration of all ramifications, expressly approved the need presented by Flughafen München GmbH and the plans submitted for the third runway. Also tied to the approval by the government of Upper Bavaria is the prompt completion of the construction project. However, the airport operator has chosen to follow the advice of Bavaria's Higher Administrative Court and not to proceed until the principal proceedings concerning the project have reached a conclusion. The decision is currently being reviewed by the court. The building permit associated with the zoning will continue to be valid for up to 15 years. While according to ICAO Regulations (Annex XIV) the new runway would have to be named 08L/26R (renaming the existing north runway to 08C/26C), it is currently assigned the working title 09/27 in all plans. In 2015, the airport received approval from Germany's Federal Administrative Court to build a third runway, dismissing all complaints and appeals, and confirming the 2014 decision of Bavaria's Higher Administrative Court to grant approval. The plans include a new 4,000-metre (13,000 ft) runway northeast of the existing airport and a new satellite building at Terminal 2, the latter of which did open in April 2016. However, construction of the new runway may yet be delayed as the project has to have unanimous approval by the airport's three shareholders: Bavaria, Federal Republic of Germany and the City of Munich. The latter has opposed the plan since a 2012 referendum. Currently, there are five parking garages and six underground parking areas, amounting together to a total of 30,000 parking spaces of which approximately 16,500 are under a roof. The parking garage P20 at Terminal 2, with 6,400 parking spaces on eleven levels (including four that are underground) since its commissioning in 2003 was the largest parking garage in Germany until the car park at the new Allianz Arena was opened in 2005. A parking guidance system was installed in the parking garages, which detects whether a parking space is occupied and newly arriving vehicles are shown where the empty parking spaces are located. Apart from the usual parking facilities, the Munich Airport offers, at additional cost, special parking spaces with additional benefits. This includes valet parking, in which the vehicle is picked up by an airport employee upon flight departure and parked, and the Park, Sleep & Fly option, in which a night at the Hilton hotel is included. Also there is an option for oversized parking spaces, the so-called XXL parking, and secure parking. Lastly, there is a special separate parking level in the P20 parking garage, where the parked cars are guarded. In addition, special services can be booked, such as interior/exterior cleaning and fuelling. To make shopping in the public areas more attractive for local residents of the airport area, there are special offers where visitors can park up to three hours for free in the P20 parking garage. Short-term parking can be found east of the central area, where visitors can park for free for a maximum of thirty minutes. During the holiday periods other cheaper options are provided in the P8 parking garage. The airport authorities have set out to cater for visitors and sightseers by creating a 'Visitors Park' which includes a 'Visitors Hill', from which a good view of the westerly aircraft apron and Terminal 1 can be obtained, as well as a restaurant and a shop for aircraft models and other collectors' items. This location is served by a railway station named 'Besucherpark'. The view from the hill is shown in the above widescreen image of the Terminal 1 apron. Three historic aircraft are on display in the park, a Super Constellation, a Douglas DC-3, and a Junkers Ju 52/3m. There is also a visitors' viewing terrace on the roof of Terminal 2 that features a wide, glassed balcony with seating areas and gives a view of the easterly aircraft apron. All visitors can access the terrace from the landside. The entrance fee was abolished in September 2013. There are two additional smaller Visitor Hills on the north end of the north runway and at the center of the south runway. Lufthansa maintains a Flight Operations Center at the airport for crews based here at its secondary hub. In 2014, its subsidiary Lufthansa CityLine relocated their administration offices from Cologne to the grounds of Munich Airport. Additionally, there is a large Lufthansa Technik maintenance facility which can handle up to six Boeing 747s at once. There are two hotels directly on the airports grounds, the Hilton Munich Airport (which was the Kempinski Hotel Airport Munich until 31 December 2014) near Terminal 2 and a Novotel at the long-term parking area with several more in the nearby villages. German car manufacturer Audi established a large training facility for its retailers on the grounds of the airport in 2010. Designated areas near the apron are used for drive training. The defunct German airline DBA, originally Deutsche BA, had its head office on the grounds of the airport and in Hallbergmoos. Since November 2005, the Munich Airport has a certified environmental management system according to DIN ISO 14001 and EMAS. From the beginning, the state-administered parts of nature conservation aspects were considered in the planning of the airport. At the opening of the airport, 70% of the grounds were planted; today there are 925 of the 1,575 hectares which remained planted, only 60%. The prevalent Erdinger Moos area with its many intersecting small streams, and woodland series was taking into consideration in the planning by the landscape architect. At the same time, consideration was taking in making the airport unattractive to birds, in order to prevent bird strikes. An additional 230-acre green belt was placed around the airport as a compensation area, in which the overall compensation areas extend over 600 acres. Even with the focus on the environment, environmental groups criticize the enormous land consumption of the airport and each additional expansion project. Also, they believe that the compensation areas are not sufficient enough in order to compensate for the damage caused by the airport. The construction in the Erdinger Moos area had a large impact on the water budget of the region, since the groundwater levels in the marshy landscape had to be greatly reduced in which drainage ditches were created. Existing watercourses, such as small streams, were not interrupted, but redirected so that they run either around or underneath the property, lowering the effects of groundwater reduction to only the areas in which the airport is located. The wastewater from the airport and the collected rain water are returned to the natural water cycle. In order to accomplish this, 100 km of sewer lines were laid, seven pumping stations, a water treatment plant and four rainwater sedimentation tanks were built and put into operation. The already rough cleansed water is then purified in a purification plant. For the necessary winter de-icing of the airport, deicing chemical such as glycol are used and collected together with the contaminated melted water and then either purified or reused. The cleaning is done in the degradation system area, where soil bacteria decompose the glycol into harmless components of water and carbon dioxide. To reduce noise from thrust reversal during aircraft landings, the runways were built to a length of 4,000 meters, however the noise reduction is offset by increased taxiing times. To reduce noise pollution, a hall for engine testing was built. After 11 p.m. engine tests may be carried out only with the approval of air traffic control. To motivate airlines to use low-noise aircraft, the airport charges are calculated according to the level of noise pollution. There are 16 stationary noise measuring points at the airport. At Munich airport there is no strict ban on night flights, but a ban on flights arriving and departing between 10 p.m. and 6 a.m.. The only exemptions are flights from mail services and DFS survey flights. From midnight until 5am only those flights that operate in the interest of the public are generally possible, this includes so-called emergency flights: police and rescue helicopter missions or medical emergencies. Also, aircraft movements for security reasons such as for precautionary landings are allowed at all times. Flights with special permission from the Bavarian Ministry for Economic Affairs, Infrastructure, Transport and Technology are also feasible at this time. From 10 p.m. to midnight and 5 a.m. to 6 a.m. flights are possible through the so-called bonus list. Exceptions are delayed flights or premature landings if these aircraft are at least noise-admitted according to ICAO Chapter 3. In addition to both the bonus list and noise requirements they must fulfill further conditions, this includes that the airline must have a maintenance base at the airport, the maximum number of 28 scheduled flights per night (charter and scheduled services) must not be exceeded, the aircraft is not louder than 75 db (A) or it is an education or training flight. This rule applies until the total annual volume is exhausted in air traffic movements by these regulations. More flights of this type are then no longer allowed. The number of night flights increased from 1999 to 2007 from 42 to 60 flights average per night. Residents have been protesting for years against aircraft noise, in particular against the noise pollution at night. The Government of Upper Bavaria approved the night flight regulations currently in force in 2001. Most of Munich airport's electricity and heat is generated by its own cogeneration plant (CHP), which is located south of the northern runway to the west of the airport. CHP has nine so-called cogeneration modules, seven run on diesel fuel, the other two on gasoline. The electrical generating capacity is 18.5 megawatts. The cogeneration modules run smoothly all year long; this creates surplus heat at certain times which is stored in heat storage to be used later. In summer, the heat generated is used for the operation of the absorption refrigerating machine. The total gross utilization rate is 78 percent (diesel) and 83 percent (gasoline). The cogeneration modules are an obligation, from the Renewable Energy Sources Act, so that Munich Airport can generate electricity from renewable energy sources, using biogas. The airport also has a connection to the district heating network of the Zolling power plant. There is a photovoltaic system on the roof of the central hall of Terminal 2. It is a joint project of BP Solar, German BP, Bundesdeutscher Arbeitskreis für Umweltbewusstes Management, Lufthansa, Munich Airport and others. In operation since 10 July 2003, it generates an average of 445,000 kilowatt hours per year, equivalent to the consumption of 155 households. The power comes from 2,856 modules of silicon cells, covering a total area of 3,594 square metres. It is expected to save 12,000 tons of carbon dioxide emissions over its 30-year lifetime. €2.65 million EUR were invested in the plant. The plant produces direct current, which after conversion to alternating current is initiated immediately in the power system. In Terminal 2, the energy currently generated is displayed on an overhead screen, which also displays other information. A biofuel gas station supplying rapeseed oil fuels, ethanol fuel and biomethane has been established, making it possible for the operating companies to convert their vehicle fleets to biofuels; the station can also be used by external companies operating at the airport. Despite measures to prevent bird strikes, the northern part of Erdinger Moos is still an important habitat for birds, especially for grassland birds such as lapwing, curlew or rare winter visitors such as the harrier. This led automatically to the area being reported under the European Birds Directive as a bird sanctuary. The fencing of the airport and the large meadows inside the fence attract open meadow birds. This leads to constant conflicts and the deaths, even of rare birds as a result of airplane accidents (vortices) and safety measures to avoid bird strikes. The planned third runway 3,440,000 square metres in the bird sanctuary will be laid with concrete, eliminating 8,000,000 square metres of living space. This would represent substantial interference with the bird sanctuary. For the safety of passengers and flight operations, four inspections by the Federal Police, departments of the Bavarian State Police (Police Inspection Munich Airport, PP Oberbayern Nord) and the security department of Flughafen München GmbH are responsible. The airport police station is located in Nordallee 6, and the police officers working there have an adapted qualification to the specific field of application, for example, they are also trained in the case of an aircraft hijacking. Bavaria's police helicopter squad is also based at the Munich Airport, where five of the Eurocopter EC135 helicopters are stationed. A move of the unit to Schleißheim airport is planned for 2020. In addition, one of the world's two chambers for explosive goods (the second one is located at Kuala Lumpur International Airport) is located on the airport grounds. In this chamber explosive substances can be defused. The airport has its own fire department with 32 fire engines distributed over two fire stations, which are located near the runways. They are positioned in a way that the emergency vehicles can reach every point of the apron, taxiway and runway in a maximum of three minutes, as long as no adverse weather conditions prevail. Should larger missions occur, the fire departments of the surrounding municipalities can be called in, which can provide up to 36 vehicles and about 216 men; in exchange, the airport fire department helps in large fires in the region. Most recently, this happened when a BMW plant in Eching went up in flames. *) The sum of the missions also includes other missions such as guided tours. Emergency medical care is provided by a rescue guard on Nordallee operated by the Malteser Hilfsdienst under a public service contract. A rescue vehicle is ready for use around the clock, which is also used outside the airport area for normal emergencies. If necessary, other rescue workers from the region or supraregional are used, the deployment coordination is carried out by the integrated control center which is also responsible for the area of the airport. On the premises of the airport is an emergency physician from the medical center that arrives on the emergency site, when required, in a separate vehicle according to the rendezvous procedure. Munich Airport is accessible via nearby Motorway A 92, which connects to motorway A9 (towards Nuremberg) and Munich's ring motorway A99. Bavarian State Road St. 2584 connects A 92's exit 6 (Flughafen München)—an incomplete interchange that can only be used by traffic to and from the west—to the terminals. Access from the east is possible via exit 8 (Freising Ost) and Bavarian State Road St. 2580, which connects to St. 2584 in the east of the airport. There are two railway stations on the grounds of Munich Airport: Munich Airport Terminal station is located in a tunnel directly beneath the central area between both passenger terminals. A second station called Besucherpark (German for Visitors' Park) is located in the area that contains the cargo and maintenance areas, long-term parking, administrative buildings and the Visitors' Park from which the station gets its name. The airport is connected to the city by Munich suburban railway (S-Bahn) lines S 1 and S 8. The ride takes approximately 45 minutes to the Marienplatz station in the city centre. S 1 runs from the airport through the northwestern suburbs and reaches the city centre from the west (Hauptbahnhof – Marienplatz – M��nchen Ost), while S 8 comes in from the eastern suburbs passing the stations from the opposite direction. The S-Bahn from the airport to the city runs approximately 20 hours a day with a short break between 1:30 a.m. and 4 a.m. Furthermore, a scheduled regional bus service 635 connects the airport within 20 minutes to the Freising railway station, providing access to regional trains towards Munich as well as to Nuremberg, Regensburg and Prague. A second tunnel beneath the terminals is currently unused. Originally, there were plans to use it for intercity railway, then for a Transrapid maglev train making the trip to München Hauptbahnhof in 10 minutes. However, this project was cancelled in March 2008 due to cost escalation. Discussions regarding a faster connection between Munich city centre and the airport have taken place for several years, as the journey time of 40–60 minutes faces ongoing criticism. As of September 2015, construction works to connect the airport with regional railway services of Deutsche Bahn to and from the north-east had started. This project, called Neufahrner Kurve (Neufahrn curve after the nearby town of Neufahrn bei Freising), will see the existing southwest-bound S-Bahn tracks being expanded with a curve leading to the north, connecting them with the already existing tracks of the Munich-Regensburg line. This new connection will enable hourly regional express train services from Regensburg via Landshut directly to the airport without the need to use a connecting bus coming from the north or to go to Munich city center at first and then all the way back to the airport. The entire project was completed in November 2018. On 9 December 2018, the new hourly service, "Flughafenexpress," between Regensburg and Munich Airport commenced, and the journey time is 75 minutes. From Landshut, the travel time is 35 minutes. In 2019, the train service to Ingolstadt is planned with two-hour interval. MVV regional bus lines connect the airport to the nearby city of Freising as well as Erding and Markt Schwaben. Lufthansa Airport Bus provides an alternative to the S-Bahn, stopping at Nordfriedhof U-Bahn station and Munich Central Station. At the beginning of the 1990s, the Deutsche Bundesbahn considered four options for a better railway connection to the airport. At an estimated cost of between 500 million and 2 billion Deutsche Mark, each option would have allowed the airport to be integrated into the ICE network. However, the idea was rejected and instead concentration was placed on a better connection of the airport to regional transportation as well as to the München Hauptbahnhof. After the cancellation of Transrapid proposal, several alternative proposals had been put forward that would utilise the current railway system with minor technical upgrades. One proposal called "Humpel-Express" would utilise the most of current Munich-Regensburg railway and S1 lines with very limited stops along the route. The "Humpel-Express" would travel at 200km/h and depart the Central Station and Munich Airport at 15-minute interval. The biggest issue was frequent level crossing closures at Fasanerie and Feldmoching (total of 39 minutes for every hour), causing the severe traffic congestions. Additionally, the construction of new line between Moosach and Munich Airport would cut through several towns and neighbourhoods, which the residents vehemently opposed. The new line also required the construction of new viaduct over the federal highway B471, increasing the cost further. The opposition from the resident and unwillingness to allot additional funding killed the proposal. With the Second S-Bahn Tunnel under construction, the proposed Airport Express service will peruse second S-Bahn tunnel upon completion with one stop, instead of four, at Marienhof between Hauptbahnhof and Ostbahnhof. This would reduce the travel time between Hauptbahnhof and Munich Airport to 30 minutes. Additionally, Deutsche Bahn has proposed the underground four-track S-Bahn tunnel from Leuchtenbergring to Halbergmoos S-Bahn stations. This would eliminate the need to slow down before passing through the intervening stations and the need to close the level crossings frequently. If the four-track extension is approved and constructed, the travel time would be reduced further to 15-18 minutes. Through the extension of different subway lines to the intersection with one of the two airport suburban railways, the travel time to the airport from different parts of the north of Munich can be considerably reduced. This was realized for the suburbs of Milbertshofen-Am Hart and Feldmoching-Hasenbergl with the subway line U 2 to the S 1 station Feldmoching in 1996 and the construction of the airport connector near Neufahrn in 1998. In 2010, the travel time to the airport from Moosach, Schwabing West and Neuhausen-Nymphenburg districts was shortened by connecting the subway line U 3 to the S 1 station Moosach. The extension of the U 6 from Garching to Neufahrn is currently being examined. The Erdinger Ring connection is to extend the S-Bahn (S2) from Erding in the direction of the airport and connect to neighboring Freising through a connecting curve, the Neufahrn Link. It will fulfill the demand of a rail connection between Eastern Bavaria, including the neighboring airport commuter cities Moosburg and Landshut, to the airport, realized with its own regional railway line. A faster connection from the airport to the inner city is not achieved by the Erdinger ring connection, however a direct connection between the airport and the Munich Messe would be. For this, the S2 would also make a short route north of Messe München and have a stop north of the exhibition center. Already before the opening of the airport there were plans for a regional station at the airport. To this, a railway connection from Mühldorf am Inn is to be made between Erding and Dorfen with the help of the Erdinger ring connection as well as a short new construction single-track called Walpertskirchner Spange. The actual planning phase for this also began, as in the case of the Erdinger ring connection, in August 2006. On 29 August 2013, the Bavarian Administrative Court rejected the complaints against the plan approval decision of the Neufahrn Link of October 2012 and therefore freed the way for a direct rail connection of the Munich airport from Regensburg, Landshut, Moosburg and Freising. The Neufahrner Kurve is to connect the railway line Landshut-Munich from Neufahr with the railway connection line Neufahr-Flughafen Munich, approximately 2.5 kilometres long, two-track and electrified section of the line. In the construction and financing agreement, signed by rail and free-trade in April 2013, it was agreed that the Neufahrn Link will be built and put into operation by the end of 2018. On 9 December 2018, the new train service to Regensburg and Landshut has commenced. According to the airport, the growth of air traffic in Munich from 1997 to 2006 was an average of 7% per year, and the airport's capacity was already exhausted. Since new airlines in Munich no longer received the desired slots, a traffic-spoiling effect occurred. An air traffic forecast of Intraplan Consult GmbH estimated 58.2 million passengers for 2025, provided the airport has a tight-fitting growth. In order to exploit the expected traffic potential in Munich, the operator plans to expand today's capacity from 90 movements per hour to 120 movements per hour by constructing a third runway. The shareholders of Flughafen München GmbH (FMG) stated that the construction of a third runway was necessary for the Munich region and for Bavaria as a whole, for reasons of transport and economic policy. Various associations and institutions from economics and politics reacted in favor of the plan approval decision issued by the government of Oberbayern for the construction of a third runway at Munich Airport. The project for the construction of a third runway is particularly appealing in the directly affected airport region of the counties of Freising and Erding, but also in other nearby counties. Among other things, one calls for the use of larger machines in order to meet demands and, above all, the growth projections presented by FMG. The opponents of the expansion project joined forces to form the action alliance aufgeMUCkt (over 80 groups, including citizens' initiatives, ecclesiastical groups and environmental organizations), supported by, among others, the BUND in Bavaria, that organized many demonstrations. The Catholic Church, which is the owner of some of the affected sites, also announced resistance to the construction. Since the plan approval decision of 26 July 2011, more protests have taken place. On 29 October 2011, a large demonstration with around 7,000 participants took place in Munich in Marienplatz directly in front of the Old Town Hall. ^ "Dynamisches Verkehrswachstum am Münchner Flughafen". www.munich-airport.de. ^ Flughafenverband ADV. "Statistiken IVF 2013 - Flughafenverband ADV – Unsere Flughäfen: Regionale Stärke, Globaler Anschluss". Archived from the original on 24 May 2015. Retrieved 2 June 2015. ^ "EAD Basic - Error Page". Retrieved 2 June 2015. ^ "12 months". ACI.aero. Retrieved 23 September 2016. ^ "Year to date". ACI.aero. Retrieved 23 September 2016. ^ "Early days (1967-1969)". Archived from the original on 5 July 2011. Retrieved 2 June 2015. ^ "Munich's traffic doubles in 10 years; Lufthansa adds more routes than it drops as a host of new airlines announce new services". anna.aero. 20 April 2010. ^ Achim Schaffrinna. "Flughafen München erhält neues Corporate Design". Design Tagebuch. Retrieved 2 June 2015. ^ "aero.de - Luftfahrt-Nachrichten und -Community". aero.de. Retrieved 2 June 2015. ^ "Facts & Figures". www.munich-airport.com. Retrieved 7 August 2018. ^ "Munich International Flight Hub". Flight Hub Reviews. 2 May 2015. Retrieved 2 June 2015. ^ "Germanwings wechselt Terminals in München". Archived from the original on 15 April 2016. Retrieved 2 June 2015. ^ "Travel ONE: Produkt". travel-one.net. Archived from the original on 4 March 2016. Retrieved 2 June 2015. ^ "Erdinger Moos - Flughafen modernisiert Terminal 1". Süddeutsche.de. Retrieved 2 June 2015. ^ a b "München installiert erste Fluggastbrücken am Satellitengebäude - FLUG REVUE". FLUG REVUE. 2 April 2015. Retrieved 2 June 2015. ^ "Munich Airport - New passenger facility at Munich Airport to open on April 26 2016". Archived from the original on 2 February 2016. ^ "Der Satellit ist gelandet". www.ovb-online.de. 23 April 2016. ^ "Lufthansa and Munich operator approve Terminal 2 satellite". Retrieved 2 January 2011. ^ "Munich Airport – Edeka". Munich-airport.de. Archived from the original on 27 December 2013. Retrieved 4 July 2013. ^ DC Airports (20 August 2007). "Erläuterungsbericht Technische Planung Luftseite" (PDF). Planfeststellungsverfahren 3. Start- und Landebahn (in German). pp. 16, 42. Archived from the original (PDF) on 4 March 2009. Retrieved 24 November 2008. ^ "Green Light for Munich Expansion". Airliner World: 8. October 2015. ^ "Parking areas". Munich Airport. Archived from the original on 20 April 2013. Retrieved 27 May 2015. ^ "Parkhaus Airport" (in German). BFK Architekten. Archived from the original on 27 May 2015. Retrieved 27 May 2015. ^ "Parking and shopping". Munich Airport. Archived from the original on 15 January 2014. Retrieved 27 May 2015. ^ "Munich Airport - Flightsearch/Timetable". Munich Airport. Retrieved 16 February 2019. ^ Shine, Conor (21 August 2019). "Planning a European vacation? DFW Airport will have two new route options next summer". Dallas Morning News. Retrieved 21 August 2018. ^ "Neue Strecken - Buchen - Eurowings". Eurowings.com. Retrieved 23 December 2017. ^ "Mit Eurowings nach München". Flughafen Berlin Brandenburg. Retrieved 13 March 2019. ^ a b "Lufthansa Group - Newsroom : Lufthansa Group optimizes hub management of the net-work airlines and prepares for moderate growth in summer 2019". newsroom.lufthansagroup.com. ^ a b "Lufthansa Short/Mid-Haul W18 network additions". routesonline. Retrieved 23 July 2018. ^ "Deutsche Lufthansa setzt auf Rostock" [German Lufthansa sets on Rostock] (in German). Flughafen Rostock-Laage. 14 March 2019. Retrieved 15 March 2019. ^ "Lufthansa resumed São Paulo-Munich flight, suspended in 2016" [Lufthansa retoma voo São Paulo-Munique, suspenso em 2016] (in Portuguese). Folha de S. Paulo. 3 April 2019. Retrieved 4 April 2019. ^ a b c "Lufthansa starts the summer with new European destinations". Lufthansa. Retrieved 21 October 2018. ^ a b "Flight". fti.de. 14 October 2018. ^ "ReisebÃ¼ro PRISHTINA: GÃ¼nstige FlÃ¼ge nach KOSOVO, Deuschland und Schweiz - Online Buchen nach PISHTINA - Basel, ZÃ¼rich, STUTTGART, MÃ¼nchen". www.flyrbp.com. ^ a b c Liu, Jim. "Turkish Airlines expands Dusseldorf / Munich network in S19". Routesonline. Retrieved 2 April 2019. ^ "BOEING 747 OF AIRBRIDGECARGO AIRLINES GOES TO BAVARIA". AirBridgeCargo. 29 April 2014. Archived from the original on 2 May 2014. Retrieved 30 April 2014. ^ "Senator International Launches Atlantic Air Bridge". cargoforwarder.eu. 24 July 2016. Retrieved 5 November 2016. ^ Flughafenverband ADV. "Flughafenverband ADV – Unsere Flughäfen: Regionale Stärke, Globaler Anschluss". Retrieved 2 June 2015. ^ Annual Traffic Reports (31 May 2016). "Munich Airport". www.munich-airport.de. Archived from the original on 31 May 2016. ^ Annual traffic. "Traffic figures". www.munich-airport.com. ^ "Flughafen München - FOC - Flight Operations Center". Retrieved 2 June 2015. ^ COMKOM° GmbH, Germany. "Lufthansa CityLine - Contact". Retrieved 2 June 2015. ^ "Standort: München - Lufthansa Technik AG". www.lufthansa-technik.com. ^ "Kempinski verliert Flughafen-Hotel in München – Erweiterung zu Hilton-Doppelmarke geplant". HOTTELLING 2.0 – DIGITAL NEWS FOR HOTELIERS. Archived from the original on 23 March 2015. Retrieved 2 June 2015. ^ "Flughafen München - Hotels". Archived from the original on 12 May 2015. Retrieved 2 June 2015. ^ "Audi eröffnet Trainingscenter in München". Retrieved 2 June 2015. ^ "World Airline Directory." Flight International. 29 March-4 April 1995. 68. "Wartungsallee 13, Munchen-Flughafen, Munchen D-85 356, Germany"
^ "Contact Us." DBA. 4 February 2004. Retrieved on 21 January 2010. "dba Luftfahrtgesellschaft mbH Wartungsallee 13 85356 München,. Munich Airport Germany" The address on Google Maps goes to "Wartungsallee 13 85356 Hallbergmoos, Germany." ^ a b c d e "Perspectives" (PDF). Munich Airport. 4 August 2008. Archived from the original (PDF) on 3 March 2016. Retrieved 17 December 2014. ^ "General information". Munich Airport. Archived from the original on 17 December 2014. Retrieved 17 December 2014. ^ "Landscape concept and planning". Munich Airport. Archived from the original on 17 December 2014. Retrieved 17 December 2014. ^ "Bauernverband und BN kritisieren Landverbrauch" (in German). Bund Naturschutz Kreisgruppe Erding. Retrieved 17 December 2014. ^ "Water management". Munich Airport. Archived from the original on 17 December 2014. Retrieved 17 December 2014. ^ ""Lärmsteuer" für laute Flugzeuge" (in German). Der Standard. 11 September 2007. Retrieved 17 December 2014. ^ "Noise control". Munich Airport. Archived from the original on 17 December 2014. Retrieved 17 December 2014. ^ "Night flight operations". Munich Airport. Archived from the original on 17 December 2014. Retrieved 17 December 2014. ^ "Lufthansa celebrates 10th Anniversary of Solar Panels at Munich Airport". Airport World. 2 July 2013. Retrieved 12 January 2015. ^ "Biodiversity". Munich Airport. Archived from the original on 17 December 2014. Retrieved 12 January 2015. ^ "Bundespolizeidirektion München" (in German). Bundespolizei. Retrieved 6 June 2017. ^ "MVV - Air travellers". 15 December 2014. Archived from the original on 20 May 2015. Retrieved 2 June 2015. ^ "Neuer Zug von Regensburg zum Flughafen München" (in German). Bayerisches Rundfunk. 15 September 2015. ^ Bayern Bahnland (16 November 2018). "Neue Zugverbindung: In 75 Minuten von Regensburg zum Münchner Flughafen" (in German). Wochen Blatt. ^ Ein Jahr Hochgeschwindigkeitsverkehr (in German). Deutsche Bahn. 1992. pp. 4–6. ^ Alexandra Vettori (11 July 2016). "Wo bleibt der "Humpel-Express"?" (in German). Süddeutsche Zeitung. ^ Johannes Welte and Felix Müller (13 November 2015). "Geheimplan: Flughafen prüft eigene Expressbahn" (in German). Münchner Merkur. ^ Florian Zick (31 March 2017). "Ganze Region will in den MVV Neue Pläne fürs Netz: das wird eine Mega-S-Bahn" (in German). Abendzeitung München. ^ "Mehr U-Bahnen und Trams für die Region" (in German). Münchner Merkur. 17 July 2017. Retrieved 5 September 2017. ^ "Weg frei für eine direkte Schienenanbindung des Münchner Flughafens aus Nordostbayern" (in German). Wirtschaftsförderung im Landkreis Dingolfing-Landau. 30 August 2013. Retrieved 29 June 2017. ^ "Planfeststellungsbeschluss für den Verkehrsflughafen München, 3. Start- und Landebahn" (in German). Regierung von Bayern. Retrieved 4 July 2017. ^ "Planfeststellungsbeschluss für den Verkehrsflughafen München, 3. Start- und Landebahn, Band 1" (PDF) (in German). Regierung von Oberbayern. 5 July 2011. Retrieved 4 July 2017. ^ Flughafen München GmbH. "Der Flughafen München – jetzt Perspektiven schaffen" (in German). Retrieved 4 July 2017. ^ "Flughafen München Prospekt" (PDF) (in German). Flughafen München. 26 October 2010. Archived from the original (PDF) on 28 September 2011. Retrieved 4 July 2017. ^ "Große Zustimmung zum positiven Planfeststellungsbeschluss 3. Bahn" (in German). Flughafen München. 9 September 2011. Archived from the original on 9 September 2012. Retrieved 4 July 2017. ^ "Wutbürger im Erdinger Moos" (in German). taz. 29 July 2011. Retrieved 9 July 2017. ^ "Streit um Startbahn spaltet die CSU" (in German). Süddeutsche Zeitung. 28 July 2011. Retrieved 9 July 2017. ^ "Landtag streitet um Flugverkehr-Prognose" (in German). Süddeutsche Zeitung. 27 April 2011. Retrieved 9 July 2017. ^ "Kleine Demonstration vor Reserl Sems verschlossener Haustür" (in German). Passauer Neue Presse. 27 April 2011. Retrieved 9 July 2017. ^ "Flughafen München Contra: Laut, dreckig und überflüssig" (in German). Bayern Online. 15 April 2010. Archived from the original on 12 October 2010. Retrieved 9 July 2017. ^ "Weiter Protest gegen Münchner Flughafen-Ausbau" (in German). Augsburger Allgemeine. 1 August 2011. Retrieved 9 July 2017. ^ "Erzbischof Marx: Kirche verkauft keinen Grund für dritte Startbahn" (in German). Münchner Merkur. 8 December 2009. Retrieved 9 July 2017. ^ "Tausende Münchner fordern "koa Dritte"" (in German). Süddeutsche Zeitung. 29 October 2011. Retrieved 9 July 2017.